Lisa Comfort is the owner of Sew Over It, a crafty café based in Clapham. It’s a haven for anyone wishing to learn a new skill, from making a 1940’s tea dress to a Roman bling, whilst enjoying tea and a slice of cake. Sewing was always a passion for Lisa as a child and her passion lead her to study at the London College of Fashion, after which she went on to work for Bruce Oldfield and Phillipa Lepley. She has appeared on the television program Kirstie’s Vintage Home with Kirstie Allsopp, and the Alan Titchmarsh show where she showed viewers how to make a Liberty Print lampshade. But after feeling that sewing was fast becoming a lost skill, she wanted to re-inspire people to pick up their needles and thread, whether by hand or machine. And when there’s a sweet teatime treat involved, why not? We spoke with the stitching fanatic to discover how she turned her love of sewing into more than just a hobby. “I have sewn since I was a little girl. Sewing has been a friend of mine through my childhood, my teens and now as an adult. I decided to turn my passion into a business and set up Sew Over It in May 2011. We are a sewing cafe where you can drop in and hire machines while enjoying tea and cake. You can also take over 30 different classes, from dressmaking to soft furnishings and leather bags, or buy one of our kits or patterns to take away and sew at home. We like to think of ourselves as a one-stop sewing shop, where you can find anything and everything related to sewing. We are based in Clapham North and are hoping to open another shop north of the river soon. 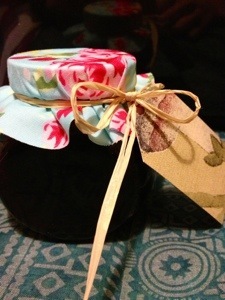 Liberty fabrics have always been up there with my favourites. Tana Lawn has been a popular choice for my dressmaking projects over the years. I now have my own mini collection of clothes made from Liberty fabrics in my wardrobe. So I was thrilled when I heard about the Lifestyle fabrics collection, and that there was going to be a new range suitable for quilting and more home based projects. Since they launched, we have used them in our café projects for cushions, bags, quilts, lampshades and lots more. The colour range are reflective of ‘Sew Over It’ colours – bright and cheerful! Today I am sharing with the Liberty Craft Blog readers the same instructions for the Liberty print lampshade I made for the Alan Tichmarch show. The idea of a patchwork lampshade came from Dominique Davant, one of our teachers at Sew Over It. Dominique shares my love of Liberty fabrics and showed me a sample she had made for herself out of scraps of fabric. I decided to do strips of fabric that are then sewn together in a patchwork, but anything works. Regular or irregular, they always look fab! Read on for Lisa’s quick and easy to follow steps for a pretty lampshade that will instantly transform any room. 1. Firstly measure the height of the lampshade paper and cut your fabric intro strips to this measurement. The width of the strips was random- varying from 6cm wide to 16cm. I wanted to use 5 different fabrics with some appearing twice and others just once. Using a rotary cutter, cutting mat and quilting ruler cut your strips into desired widths. 2. Then lay your strips in the order you want them. 3. Taking the first two strips, place them right sides together and stitch with 1cm seam allowance. Then take the third strip and add that in the same way and so on and so forth for the remaining strips. In the end you will have one long strip of fabric. 4. Press open all of the seams. Now peel back the paper from the adhesive card and slowly press onto the fabric, aligning the edges of the fabric with the edges of the card. 5. Turn over and smooth out any wrinkles. If you need to you can peel of the fabric in places and re-stick. 6. Then take the double sided tape and place a strip on one end of the card, within the scored lines. Then place the tape all the way round both rings, making sure it wraps round the edges. 7. Fold the top and bottom edges of the card along the scored lines. This should crack and then peel off to reveal a border of fabric. Remove the plastic from the double sided tape. Starting at the un-taped end of the card, place the plain ring on the top edge of the card and the ring with the bulb attachment at the bottom (facing upwards). 8. Slowly start rolling them together. It helps if you have a spare pair of hands for this step. When you get to the end peel the plastic from the tape off along the card edge and press firmly down, overlapping the fabric side of the card. 9. Roll the fabric border round the rings – this should stick to the double sided tape. Then using the triangle tool push the extra fabric in between the ring and the card. Cut off any frayed threads. Place on a lampstand and admire! This is a standard fitting so it should fit most lamps. Feeling inspired and fancy adding that personal touch to your home? You can buy the full lampshade kit here. 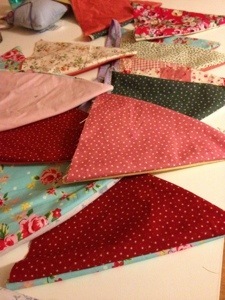 All of the gorgeous fabric I’ve made into bunting for the meditation cafe in Darlington!!! Note: We created the wallpaper to match the exact size of Fujifilm INSTAX Wide photos. We chose this instead of polaroid because the film is fairly inexpensive and accessible. It’s our favorite instant camera. Now that it is fully installed I will be covering some of the repeat photos with real Instax photos. I love that I can do this over time and that I don’t have to wait until I collect a thousand photos to create the wall! It’s so much less pressure. 🙂 Ta-Da! Here’s a photo of the finished product! I am super thrilled with the outcome. It has so much personality. I hope that this tutorial encourages some of you to try a photo statement wall. I am completely pleased with the quality, the price and the time it took us to install the wallpaper. It was a fun project and something we will enjoy for a long time. Have any of you created a photo wall? Is this something you would try?